Well, to start off, I will have to be honest and confess that due to poor internet connectivity, I am now finishing this travel log from the comfort (and bandwidth) of the computer in my office at home. So, I will probably keep things fairly brief (since I am tired!) and focus mainly on pictures this time. We arrived in Christchurch on Wednesday night, and had a lovely dinner with some friends. In the morning, we took a walk around the Christchurch botanical gardens, which were beautiful, and through the city center, which is still quite devastated from the February 2011 earthquake. Quite sobering to see all the damaged and shuttered buildings, and entire city blocks which are completely cleared away. A monumental recovery effort is underway, but there is still a long way to go. 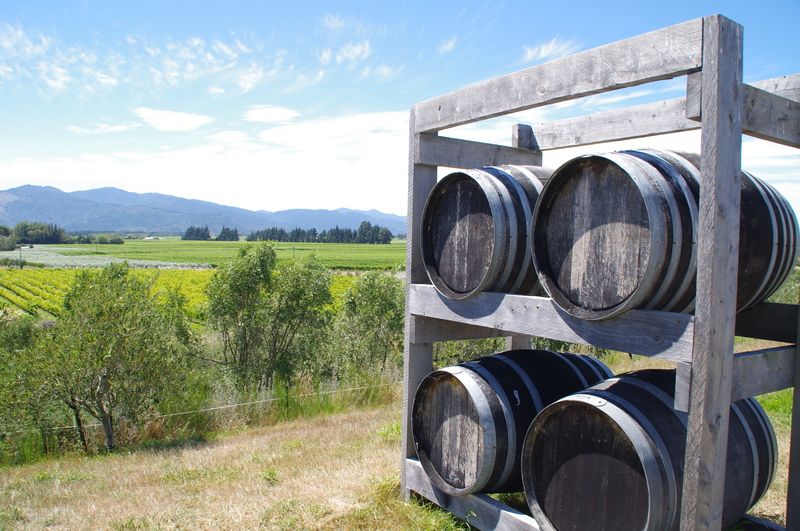 After exploring Christchurch we started our drive up towards the Marlborough wine region, near Blenheim. This drive is said to be one of the most beautiful in New Zealand, but unfortunately for us, there were low clouds most of the way, which obscured not only the sun, but also the mountains which come right up to the sea. Since conditions weren’t great, we pretty much powered through, and made it to Blenheim in time for an afternoon coffee. 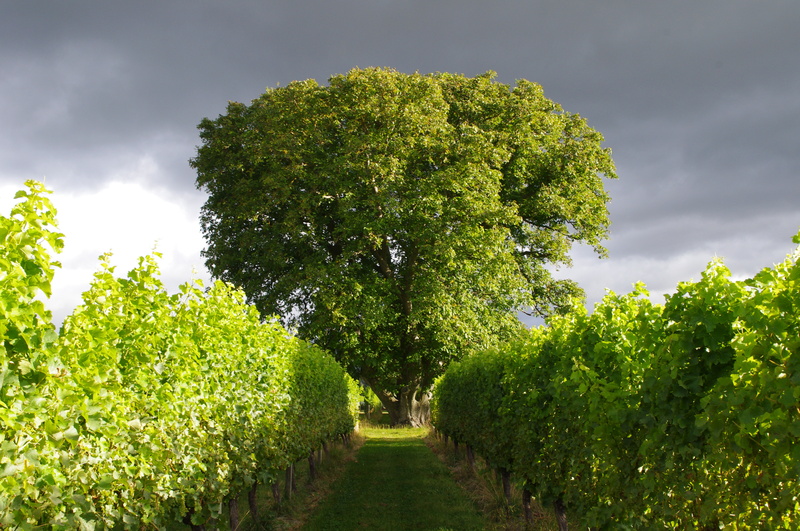 Blenheim itself is not much to speak of, but the wine country itself is absolutely stunning. Wine tasting there is really low key, we were usually the only ones in the tasting room. 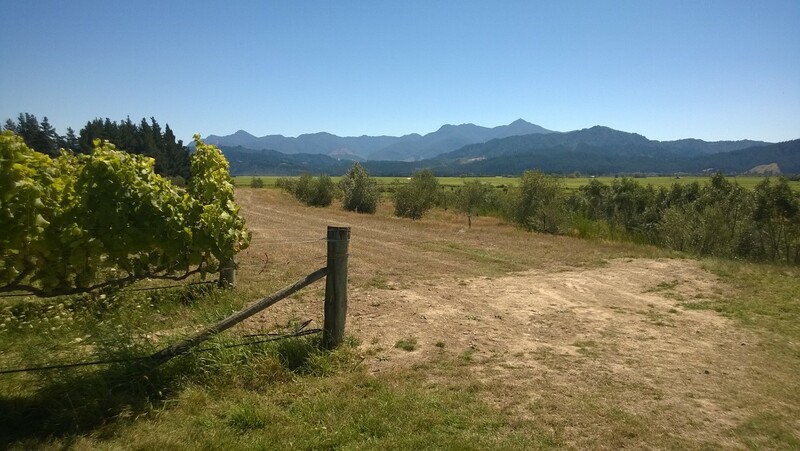 While I am fairly familiar with New Zealand Sauvignon Blanc (Cloudy Bay and other big producers are located in this region) I was very impressed with some of the other wined we tasted, particularly aromatic wines like Pinot Gris and (dry) Reisling. The Pinot Noir and Chardonnay were also very good, similar in character to Carneros here in California. 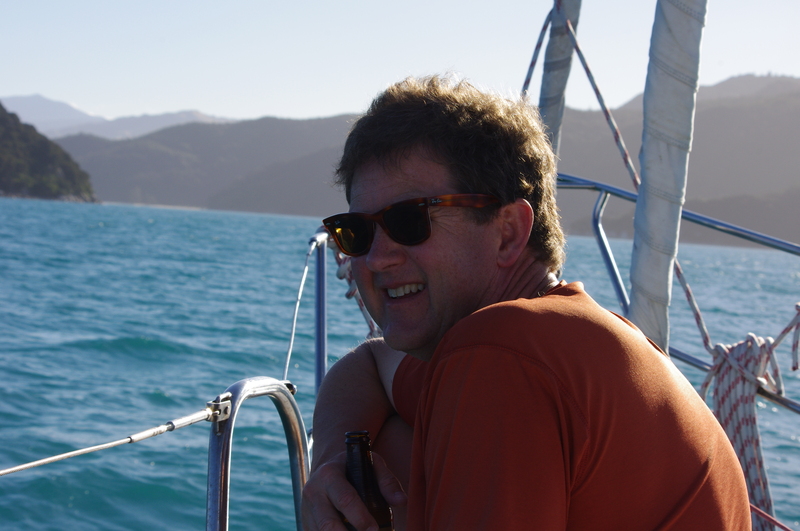 After the wine region, we headed to the Marlborough Sounds, just a short drive away. 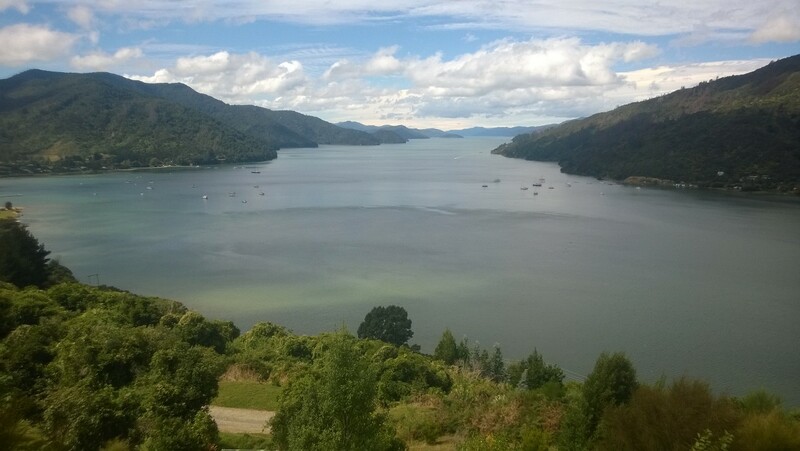 The Sounds is a large region of tree-covered islands and peninsulas jutting from the mainland out into the Cook Straight, which is the body of water between the North and South Island. 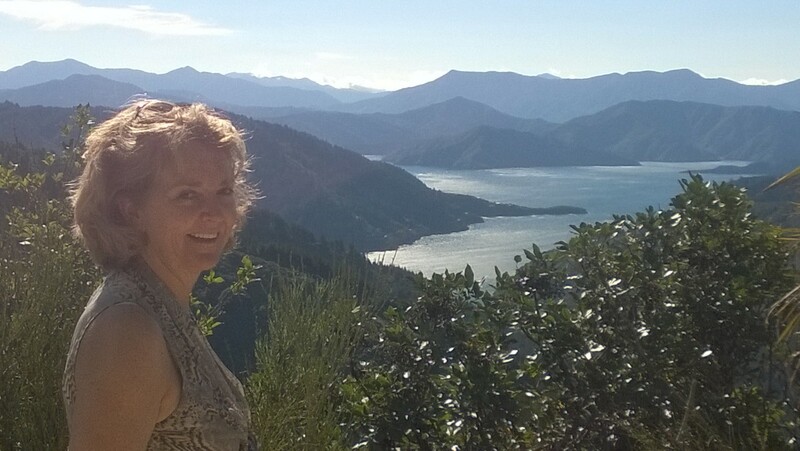 The contrast between the blue of the sea and the green of the hills is spectacular, and the (very small) lodge that we stayed at had a stunning view right down Queen Charlotte Sound. 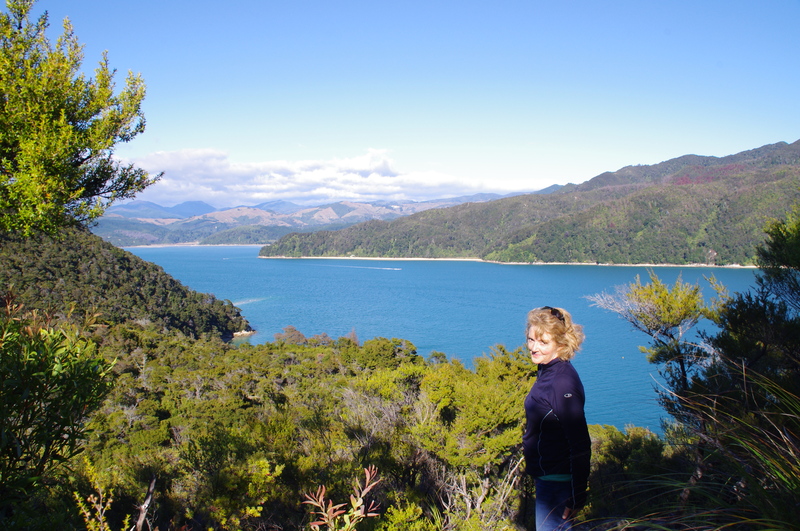 We took a nice hike on the Queen Charlotte Track to burn off some of the excesses of the wine country. Sunset was memorable. For the last leg of our trip, we headed West for an hour or so to the town of Nelson. 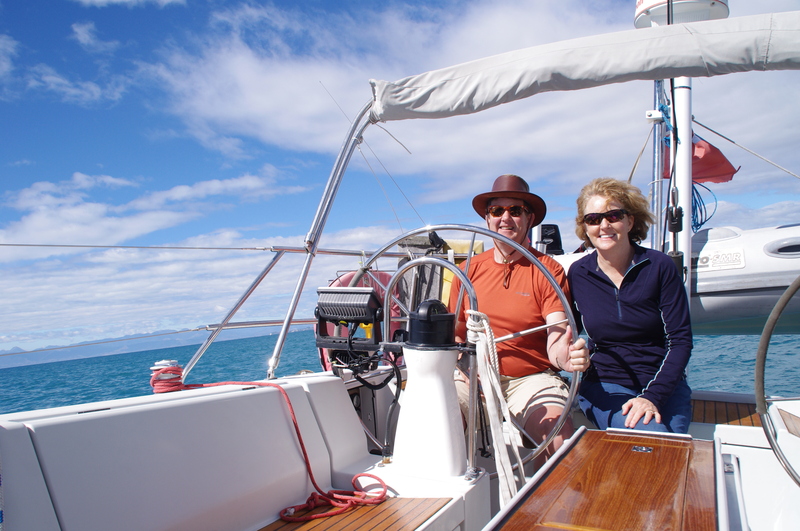 We had arranged a three day sailing trip up to Abel Tasman National Park with a company called Gourmet Sailing. It would be an understatement to say that they lived up to both parts of their name! During this little expedition we had a little bit of everything. From the sailing side, we started off with unusually powerful winds, gusting up to 35 knots at times, and pushing the boat to 8 or more knots with a reefed jib, and no other sails. We finished the trip with a lovely broad reach for 16 miles across Nelson Bay, with all sails fully deployed and a steady 15 knot breeze. 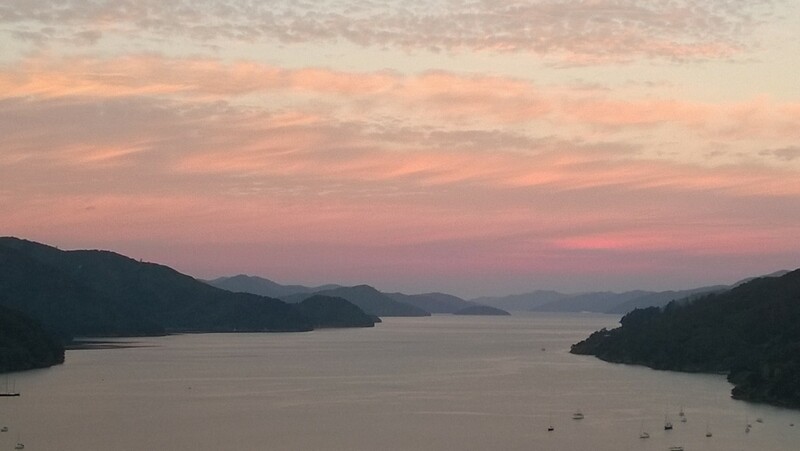 In between, we did some kayaking, some lovely hikes in the national park, slept in some beautiful, peaceful anchorages, and ate tons of really good food. As they would say in NZ, it was absolutely brilliant! Once we made it back to the harbor, we went straight from the boat to the airport, hopped on a small turboprop from Nelson up to Auckland, then switched planes to a 747, and flew twelve hours across the Pacific and back to San Francisco. This entry was posted in Travel on February 26, 2014 by John Beekley. We woke up Sunday morning to a beautiful sunny day. We started the day right with a lovely French breakfast in town. Then, it was time to see the sights! The first thing we decided to do was to ride the Shotover jet boat. 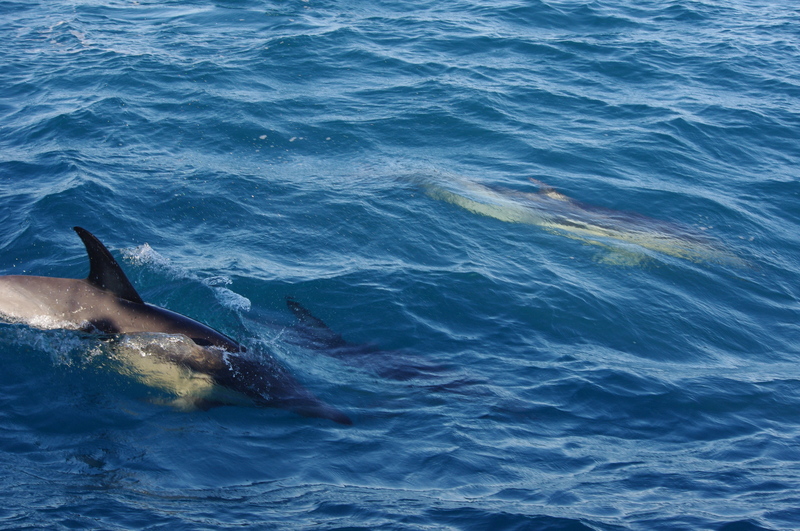 I had done a jet boat ride on the North island a few years ago, and they are a blast. Shotover is generally known as the first and best, so it was a must-do while in Queenstown. The jet boat ride was as fun as I remembered. This one went racing through a narrow canyon at 40 mph or so, skimming by the canyon walls and doing 360’s in the wide section. There were Korean grandmas in the row behind us, squealing on each sharp turn. It was a crack up. After the boat ride we decided to head to Queenstown to ride the gondola up the mountain. 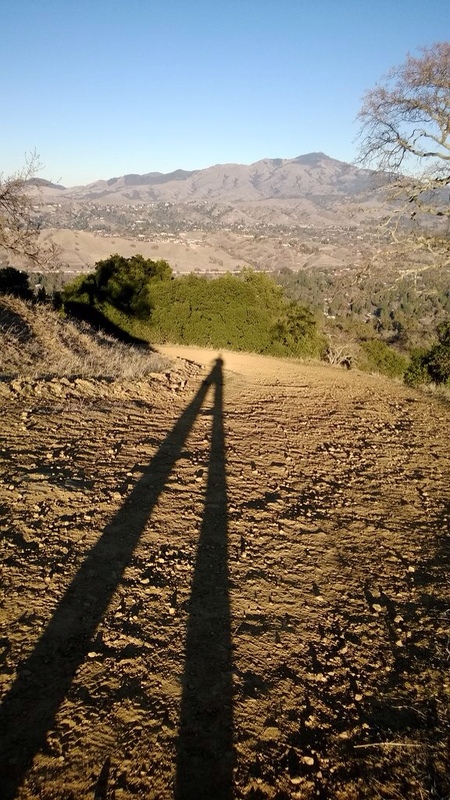 We had heard that the view was amazing there, and we figured we would check it out and then head put on a hike. The top of the gondola seems pretty much to be the extreme sports capital of New Zealand, and therefore the world. From the skydeck, we could watch bungy jumpers, paragliders, downhill mountain bikers in full pads, zipliners flying through the forest, and luge-cart riders on a concrete track. We decided to skip all that stuff, if you can believe it. We left the madness of the gondola and started our hike up Ben Lomond, the big mountain next to town. 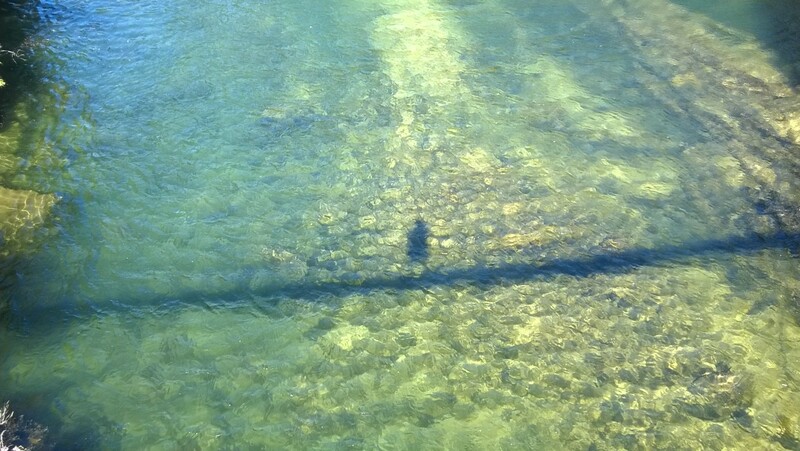 It was very clear and very hot. All in all, though, it was a magnificent hike. Check out a few pictures! After our rigorous and vigorous hiking, we felt justified in returning to our more normal vacation activity; that is, eating,drinking, and generally chilling. We awoke to rain on Monday morning. It was a driving day, so we checked out of Arrowtown and started heading south to Te Anau. Our plan was to head over the pass to Milford Sound, one of the most beautiful drives in NZ to one of the most beautiful places in NZ. Unfortunately things were attenuated a bit by the misty, cloudy, rainy weather, so while the drive was certainly impressive – dozens of thousand foot waterfalls were cascading off the cliffs due to the rain – it wasn’t exactly stunning. After this misty journey we had a lovely dinner in Te Anau, headed to our accommodations in Manapouri, and called it a night. Tuesday dawned a bit brighter, and we packed up for our 12-person overnight boat excursion on the misty and mysterious Doubtful Sound. This trip was awesome, no other way to describe it. We cruised the various as of the sound, did some kayaking, some fishing, and are plenty of seafood. We pulled in a lobster trap filled with enormous creatures, were followed by an albatross for a while, and almost crashed into porpoises while kayaking. All without a boat or human habitation in sight. Truly magical. We had a nice sleep in our very cozy berth, and had an awesome breakfast of lobster legs. 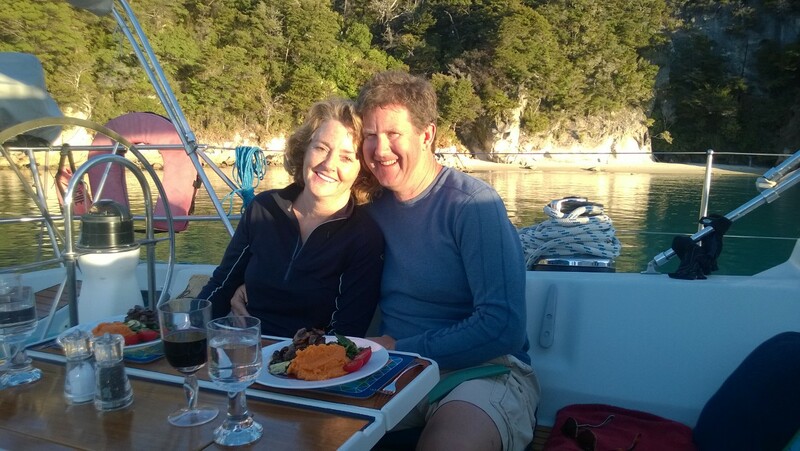 We got back to Manapouri around noon, had a leisurely and sunny drive back to Queenstown, and caught our short flight to Christchurch. This entry was posted in Travel on February 17, 2014 by John Beekley. As you might guess, the flight from San Francisco to Auckland is a long one – twelve hours, give or take. And, since my knees are getting old and creaky, we upgraded to Economy Plus so that we would have a little more legroom. I was pleased to discover that on this flight, that would put us on the upper deck of the 747. Now, this may sound silly, but ever since reading about the 747 in Weekly Reader in third grade, I had always wanted to do that – but never had the chance. So I finally got my third-grader kicks by riding up there! The flight was OK, I slept a little, watched some movies, and read a few scenes from Richard III on my now missing iPad. Air New Zealand is great, it is like a throwback to twenty or so years ago, when flight attendants were actually friendly and cared about your well-being. Ours were great, super nice, and entertaining. Guys in their late forties I’d say, one completely pumped and immaculately groomed, the other looking like he was part or even mostly hobbit. The flight from Auckland to Queenstown was routine, though the landing was a little exciting. We emerged from thick cloud cover to see towering mountain walls on both sides of the plane. Did a little slalom, then came in smooth. We arrived Saturday morning around 9:00 AM, it was cloudy with a little drizzle. Drove into town, which is a resort town reminiscent of Tahoe City, poked around a bit, and decided to drive down the lake. The drive was beautiful, and dramatic with the clouds. At the end of the lake we decided to keep going, and drove up to the trailhead for the Routeburn Track, one of NZ’s famous multiday hiking trails. We walked up the trail a few hundred feet, decided we were feeling unenergetic, and headed back for the car. We drove to Arrowtown, the town we were staying in. Charming old gold town, full of nice shops and restaurants, and beautifully set along the river, surrounded by mountains. We decided it was time for drinks, dinner, and rest. And that is exactly how we ended our busy day! This entry was posted in Travel on February 16, 2014 by John Beekley. It’s been a few weeks, so I thought I would summarize the progress I am making on the boat. 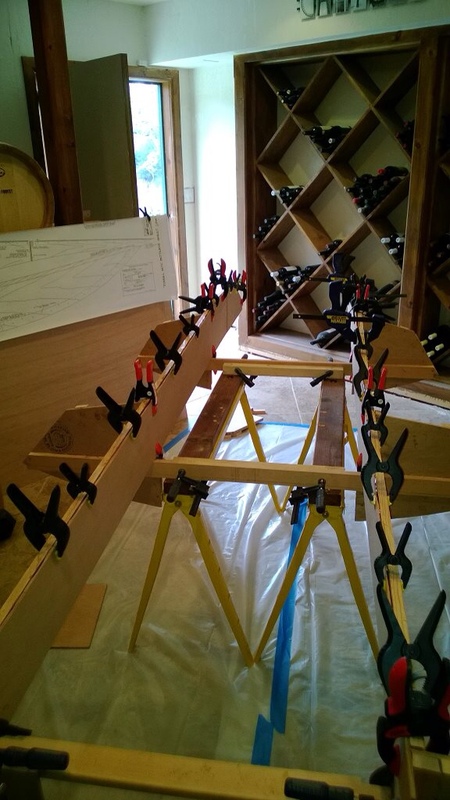 As I mentioned earlier, I am building the boat in my wine cellar. So, I’ll start off by showing you the workspace. 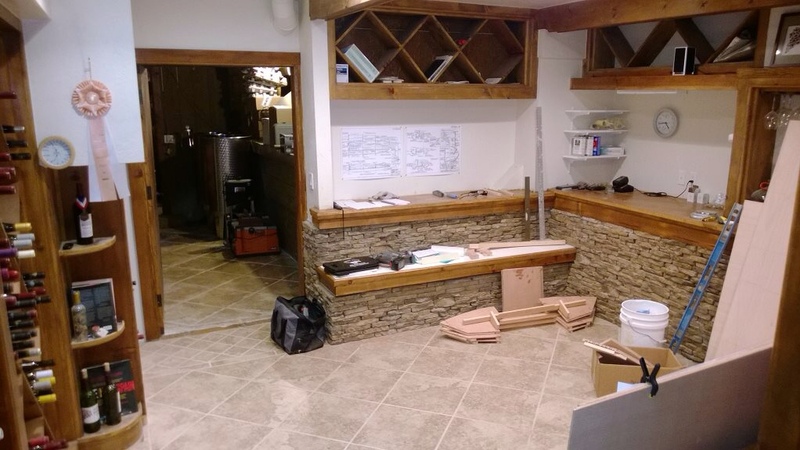 If you look around, you’ll see that the place is already filling up with lumber and plans. Building is a pretty slow process, because my woodworking skills, poor to begin with, are very rusty. And, there is lots to learn about cutting and assembling with precision, mixing and handling epoxy, etc. I am trying to go slowly, and discard any work that is sloppy or otherwise not up to snuff – which is really counter to my natural instincts. Crown molding was one of my last carpentry projects, and, trust me, caulk was my best friend! You will see that one can’t possibly possess too many clamps for this endeavor, and I suspect that I will be making another trip to Harbor Freight soon to double down. I had some time during the week this week, so I prepared the battens and the runner cleats, which will allow me to install the floor of the boat. I also spent a few hours reinforcing the frame with brass nails and screws, as appropriate. Today, prior to wasting my late afternoon and evening watching the Super Bowl, I epoxied the runner cleats to the tunnel sides, as seen in the picture below. If you look on the floor, you can also see a long strip of plywood with dumbells on it. This is basically a scarff joint being made – making the ten foot long tunnel floor by joining an eight foot piece and a two foot piece. The joint should be cured by tomorrow, and the floor can be installed. Once the floor goes in, hopefully sometime this week, we will start to look like a boat! 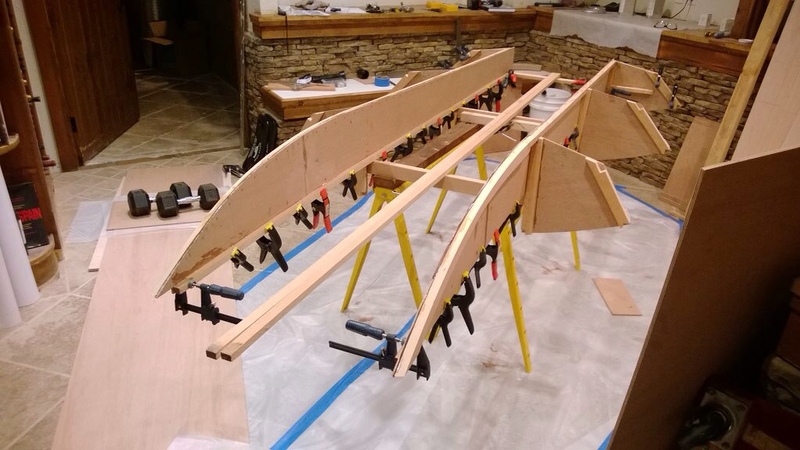 This entry was posted in Boats on February 3, 2014 by John Beekley.